Frankincense essential oil has antibacterial and anti-inflammatory benefits to the skin, making it ideal for acne-prone skin. It is also a natural toner, decreasing the appearance of pores and evening skin-tone. It is cytophylactic, which means that it helps protect existing cells and encourage new cell growth. For this reason, it helps reduce wrinkles, tighten skin, and reduce the appearance of scars. It also helps soothe chapped, dry skin. Geranium essential oil helps regulate oil production and reduces acne breakouts. It also helps improve skin elasticity and tighten skin, reducing the appearance of wrinkles. It also promotes blood circulation to the areas where it is applied, helping to heal bruises, broken capillaries, burns, cuts, dermatitis, eczema, ringworm, and other skin conditions. This baby does it all! Lavender essential oil is one I suggest no one goes without — it smells amazing, helps you relax and your body adapt to stress, and has great benefits for the skin. It helps regenerate skin cells so is great for mature skin, sun spots, and scarring. Another great oil for all skin types and needs. Myrrh essential oil greatly benefits aging skin. It has strong anti-inflammatory properties that help improve skin tone, firmness, and skin elasticity, reducing the appearance of fine lines and wrinkles. Myrrh can also help heal sun damage, chapped skin, rashes, and eczema. 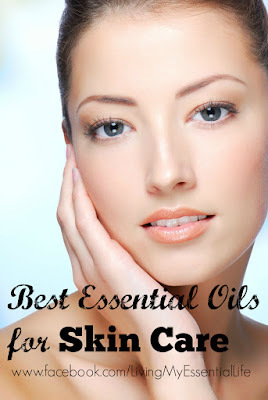 Patchouli essential oil is particularly great for aging skin. It promotes new cell growth and smooths the appearance of fine lines and wrinkles. Because it also has antiseptic, antifungal, and antibacterial properties, it can also benefit skin conditions such as eczema, dermatitis, psoriasis, and acne. Ylang ylang essential oil is one of my favorite essential oils because of its rich, floral fragrance. It is helps to control oil production and minimize breakouts. It also helps regenerate skin cells, smoothing fine lines and improving skin elasticity. Another great essential oil for every skin type.